This post may include affiliate links. If you make a purchase, I'll earn a small fee at no extra cost to you. It’s true that all plants need is sun, soil, and water…but that’s not all there is to it. Good soil is critical for growing healthy, strong plants. Whether you’re growing vegetables–like me–flowers, or just a really nice patch of dandelions, you need to prepare your soil to get the best results. Good soil has lots of organic matter (like decaying leaves and compost), nutrients for the plants, living organisms (like earthworms and fungi), and it needs to be turned or loosened so the roots can get oxygen and water can drain. 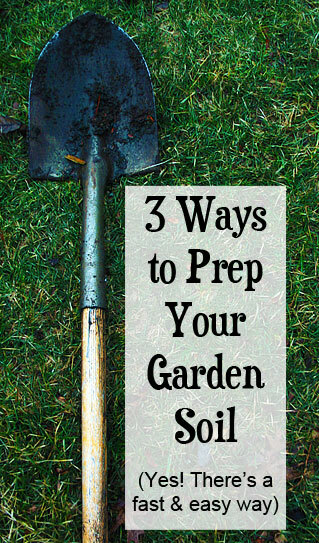 There are three different ways to prepare your soil for spring planting. Let’s check ’em out. It’s not called the lasagna method because you’re growing lasagna plants (although Hubby would really like that). With this method, you prepare the soil by layering different materials on top of each other, like the layers in a lasagna. 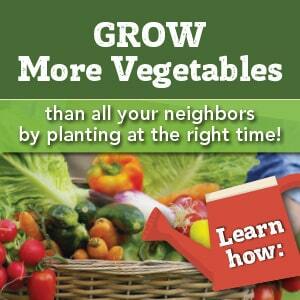 I used this method in 2010 when I wanted to take out some grass in the front yard and replace it with veggies. It starts like this: mow the grass or the weeds down as far as you can. Lay flattened cardboard boxes over the grass, right next to each other with the edges touching. Use moving boxes or non-shiny cardboard (no diaper boxes), and take off any tape because it won’t decompose. Spray the boxes with enough water to dampen, and then stomp on them a bit to get them to settle. You don’t want them to blow away before you get to the next step. On top of the cardboard, put layers of newspaper. Again, don’t use the slick ad pages but just the regular newspaper pages. Arrange them kind of like shingles so no weeds can grow through. Dampen again and stomp–carefully this time, because you’ve got two wet materials to deal with. 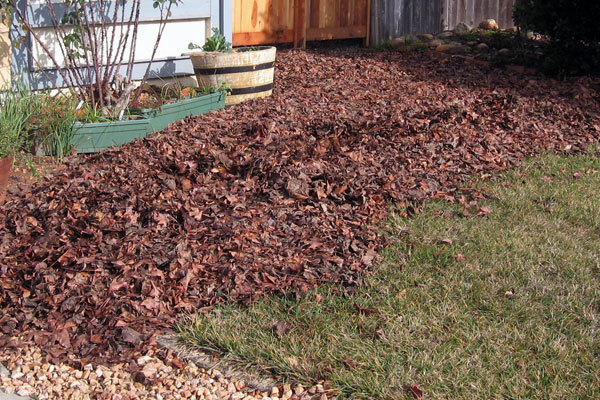 The final step is to cover the newspaper layer with a thick layer (like 2 inches or more) of shredded leaves, straw, or other “brown” composting material. 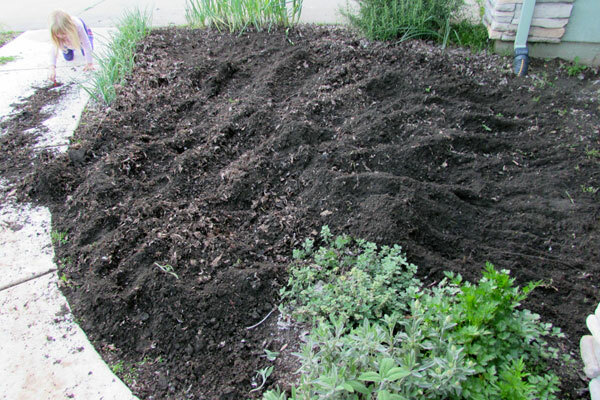 Then add alternating layers of “green” composting material, like veggie scraps, manure, lawn clippings, etc. and “brown” composting material. The final step? Wait. It takes several months for the grass to die and for the lasagna layers to break down and turn into rich, useable soil. Double digging is a soil preparation technique that most people haven’t heard of. It’s very labor-intensive and is used for plants with deep roots like carrots or beets. 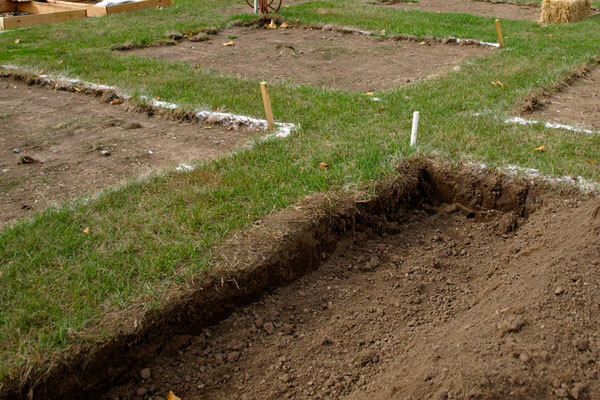 Start by digging a trench 1 foot wide and 1 foot deep. It can be as long as you want it to be. 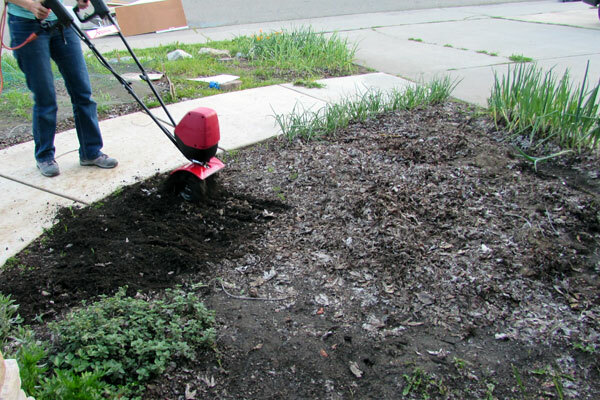 Pile all the dirt you dig up into a wheelbarrow or put it on a tarp out of your way. Then dig another trench next to the first one, also 1 foot wide and 1 foot deep with the same length. Go back to your first trench, and loosen the soil at the bottom of the trench (so you’re digging the first hole deeper). Put the soil you dug up from the second trench into the first trench. Lather, rinse, and repeat until you have dug all the trenches you need…or until your arms fall off. Fill the last trench with the soil you dug up from the first one. You knew I was going to save my favorite for last, right? The good folks at Mantis gave me an electric Mantis Tiller to try, and and it is amazing for soil prep. When you think of rototillers, you probably think of heavy, hard-to-manage beasts. That’s what the last tiller I borrowed was like. It weighed more than me, and Hubby had to use it because I couldn’t control it. The Mantis is light and powerful. It only weighs 21 pounds! It assembles easily—attach the handles to the motor, slide on and secure the blades, and you’re ready to go. Because I chose the electric tiller, there’s no gasoline to pour in it or pull-cord to start it up. Compare the different types of Mantis Tillers here. Here’s my strawberry patch, which has been sitting fallow for the winter. 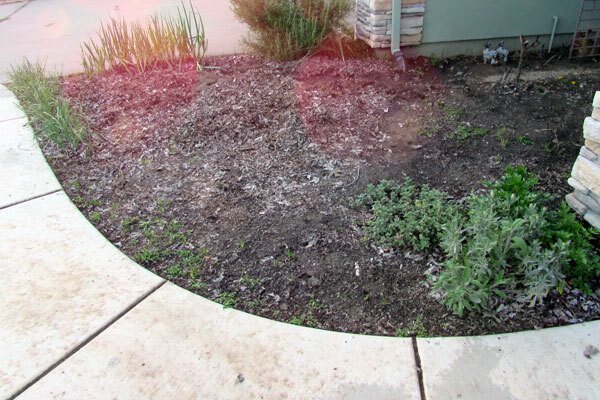 The covering of leaves kept the weeds down, but the soil underneath was compacted from all the rain we’ve had lately. I put the Mantis together and got to work. It’s easy to maneuver, so I didn’t accidentally till over my herbs, or the shallots that are planted along the walkway. I zipped right around the existing plants and didn’t have any trouble controlling what was tilled and what wasn’t. And look how rich the soil is, since it had the leaves sitting on it all winter! Now I’m going crazy and tilling up every bare spot of dirt I can find. Since we’re replacing our entire front yard with edibles, it couldn’t have come at a better time. It’s going to be so easy to convert our front yard into a vegetable garden this year. If you’re considering a rototiller or just want to make gardening easier, I definitely recommend getting a Mantis tiller. Which of these methods have you tried? Thank you so much for such a nice and inforative article about prepare soil. I love gardening. That’s why I’ve read many article on this topic. You shared lots of photo to explain the whole process. That makes your article different from others article. I’ve got huge information from your article. I will apply your suggestion to prepare soil of my garden. thanks again for your effort on this post. I’m so glad you’re here. Brown Thumb Mama is your resource for easy ways to live more naturally. Learn more about me! Natural living tips, gardening advice, and DIY awesomeness delivered right to your inbox.